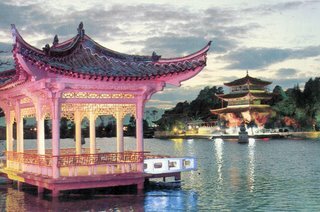 Kunming is famous for its multitudinous scenic spots and places of interests from ancient times, while the West Mountain & the Dian Chi Lake are the outstanding places among them. They are located in the southwest of Kunming in Yunnan Province. The West Mountain is 15 km away from Kunming, standing straight in the lakeside of the Dian Chi Lake and on the foot of the mountain is just the Dian Chi Lake. The Dian Chi Lake, also called "Kunming Lake", "Kunming Pond", and "Southern Lake of Yunnan" in ancient times, is a plateau lake with beautiful scenery, the lake is 40 by 8 kilometers and is 1,886 meters above sea level. The lake water and the sky seem joining mutually like a city sea, dense mist and rolling water are on the surface of the lake, and sails are strolling above the water. 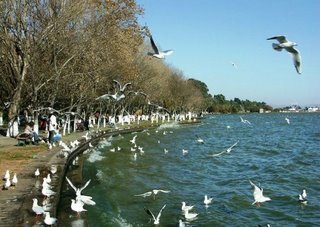 It claims to be "a pearl on the Yungui Plateau" for a long time.Being the largest lake in Kunming and the sixth largest fresh water lake in China, Dian Chi Lake is 300 square kilometers (116 square miles) in surface area, 1,885 meters (6,185 feet) in altitude and about 40 kilometers (25 miles) in length (from north to south).The west side of Dian Chi Lake is the mountain forest, while on the east side are lands dotted with the fisheries and agribusinesses. Traditional fishing boats still sail on the lake, hooking and netting. Taking a boat to voyage between the blue sky and the green water, breathing the fresh air and viewing the birds flying just at your side, what an enjoyable, light-hearted and free moment it is!.When the weather is fine, there are white flocculent or massive clouds floating in the cerulean sky, the cyan water waves under the golden sunshine and the surrounding mountains reflect their silhouettes on the water. If you take a walk on the lake shore you will feel intoxicated by the beautiful landscape.The most beautiful view of Dian Chi Lake appears at dawn and sunset, the refraction of the ethereal rays glitter on the water surface just like thousands of silver fishes swimming and playing. At night, when the breeze is fleeting over the water and the world is brimming over with hazy moonlight, Dian Chi Lake lies in silence and breathes in peace like a sleeping beauty.The ocean-like Dian Chi Lake is the best place to go for those people who wish to get away from the bustling city and be close to the nature. Facing such a beautiful and capacious place, one may forget everything even himself, the only thing left is the amazing scenery before you.On the West Mountain, you can overlook the crossed green fields and the vast green Dian Chi Lake, the high and low peaks ranged at random at distance and emerald forests and elegant meditation rooms closely.Having the advantages of beautiful scenery and rich plants on the mountain, the West Mountain has already become a large-scale forest park after the transformation by Kunming City Government. Nearly 3,000 kinds of woody plants are growing on the mountain and the Ginkgo, Yulan magnolia and epiphyllum are unique in Kunming. The sago cycas, metasequoia, yew podocarpus and peacock China fir handed over in the geology history and the rare plants in the Dianzhong Plateau such as moss, alangium and Yunnan camphor tree are in addition to the above.The Longmen is the most beautiful scenic spot on the West Mountain. If climbing the Longmen and overlooking the endless Dian Chi Lake, you will see the green wave ripples and the pretty scenes of the lake. If enjoying the Dian Chi Lake on the close Grand View Pavilion, you will see that the waving water is running to your eyes and the sails are strolling in the light mist on the lake.